Papago Buttes was a race through a large crowd that lasted only 16 minutes before I was back in my truck. Racing to Camelback Mountain there was naturally no parking and I parked down 44th street in a cul de sac about 3/4 of a mile away from the trailhead. Racing up the mountain and back down to my truck in 52 minutes I was headed to Squaw Peak. The parking lots were already full with typical Saturday crowds and the race crowds. After thirty minutes of driving the parking lots looking for a space I decided to head several miles north to Dreamy Draw Recreation Area on Northern and park there. From there I ran almost three miles over three mountain ridges to the back side of Squaw Peak and caught up with the trial from there. I summitted Squaw peak and was down in under 50 minutes and on my way back over the three ridges to my truck. Feeling great I reached 13.5 miles before I was even started on the fourth peak. 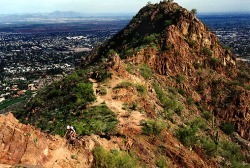 Unfortunately a 40 minute drive to the southern most part of the city to reach South Mountain and the Holbert trail. This was the longest stretch (for those that found good parking that is) of the race at 7 miles round trip and the most elevation change. I continued running for the first 2 miles up the mountain until my heart rate was hovering over 192 and my watch was beeping with a sense of urgency regarding the heart rate. I power hiked the next mile before running the remainder in the rain and suddenly cold wind. Snapping a picture I turned right around and ran hard the 3.5 miles down the mountain to my truck. 45 minutes later I was at Lookout Mountain, the shortest of all the mountains. Surprisingly steep and not surprisingly boring. 27 minutes of hiking and I was on to Shaw Butte. Exhaustion sets in here at 23 miles and I hike the entire way up the butte before turning around and running down. Most people hiked back to their vehicles to repark at North Mountain a mile or so down the road. I decided to continue running across the valley and catch some side trails to the backside of North Mountain and summit from there. I made it up North mountain quickly and stood atop the summit excited to be almost over with this extremely long day. I ran the last three miles back ending with 29.04 miles in 6 hours and 38 minutes. 8,400 feet in elevation change. By far the longest run I've ever done and only two miles less than a 50k. No blisters, no real pain that was keeping me from going on. I could certainly have kept running so it feels like the training is working!